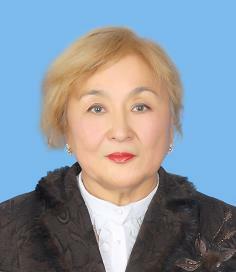 Ismakova Bibisara Serikovna, was born on January 30, 1948, Balkhash of the Karaganda region in a family of the employee. 1970-1980-worked as a teacher of Russian language and literature in secondary schools p. Aksu-ayula (Shet district), Bryansk (RSFSR), p. Agadyr Karaganda region. Since 1980-2008. – worked in Zhezkazgan pedagogical Institute, later reorganized in Zhezkazgan University. Baykonurova of senior lecturer, associate Professor, head of Department of pedagogy and psychology. Since 2008 – to the present time-associate Professor of the Department of Russian language, associate Professor of the Department of NVP of Karaganda state technical University. 29.11.2000-candidate’s dissertation “Ethno-cultural aspect of lessons on practical course of Russian language” (for students of departments “Russian language in Kazakh school”, “Translation studies” of philological faculties) was defended. Code-13.00.02.- Theory and methods of teaching and education (Russian language in primary, secondary and higher education). Almaty, ASU named. Abaya dissertation Council d14.09.04. secondary schools in modern socio-cultural conditions of the Republic of Kazakhstan” (on the example of 5-6 classes of schools with the Kazakh language of instruction). ). Almaty, ASU named. Abaya dissertation Council d14.09.04. 27.10.2011 by the decision of KNASON MES awarded the degree of Doctor of pedagogical Sciences. Research interests-Current problems of modern language education, methods of teaching Russian language in conjunction with the Kazakh, the problem of co-learning of language and culture, especially modern bilingualism and multilingualism; socio-cultural concept of language teaching, the problem of education of the individual by means of language disciplines, modern problems of ethnopedagogics. As a scientist, she is accredited to participate in major forums on language problems and problems of higher education and school education in Russia, Romania, Greece, Finland, Poland and the Emirates. № 01185 from 28 January 2008. He is the winner of the national award “Azhar” in 2012 in the nomination “Science and education” from Karaganda region. Published works more than 70.